President Donald Trump and Russian President Vladimir Putin are meeting privately, joined only by translators, in the Finnish Presidential Palace. The two leaders entered the Gothic Hall with serious expressions, moving quickly to two ornate wooden chairs set before American and Russian flags. Trump sat upright as Putin appeared to lounge in his chair. Trump deferred to Putin to make opening remarks, nodding along as his comments in Russian were translated. Trump predicted that the pair will have an "extraordinary relationship." Trump initiated a brief handshake with Putin, as the assembled press jostled to capture the moment. Putin appeared to smirk as Trump ignored shouted questions about whether he would warn the Russian leader against meddling in the 2018 midterm elections. 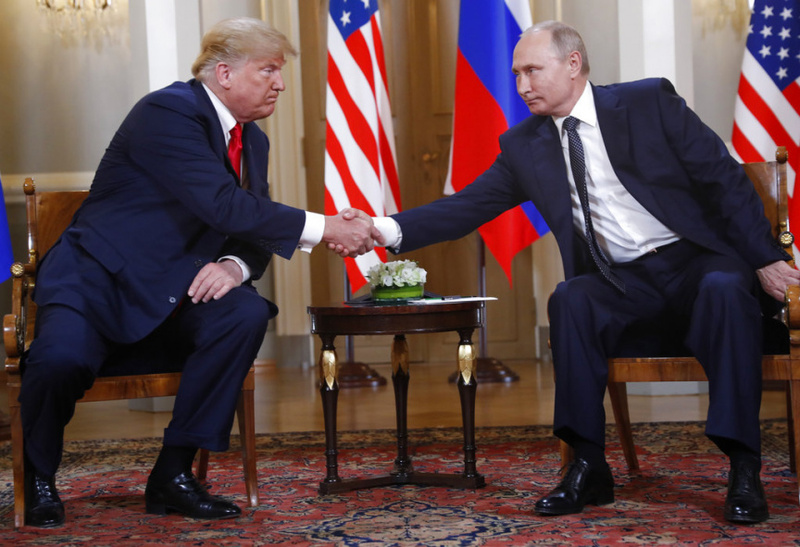 The summit between President Donald Trump and Russian President Vladimir Putin is offering a grab-bag of protests and demonstrations in Helsinki. Abortion-rights activists are dressed in artificially bulging bellies and Trump masks. Anti-fascist protesters are bearing signs with expletive-laden insults. Other demonstrations involve free traders, anti-war Ukrainians and gay rights supporters. Some demonstrators stayed near police barriers to try to register their complaints as the leaders sped by to the site of Monday's summit at Finland's Presidential Palace. Others marched by Helsinki landmarks, far away from the leaders' gathering, but in clear view of curious onlookers and visitors to the city center. The demonstrations are happening as Trump and Putin meet for their high-profile one-on-one meeting in Finland. President Donald Trump says at the start of his summit with Russia's President Vladimir Putin in Helsinki that he thinks "the world wants to see us get along." Trump says the two countries have "great opportunities," saying they have not been getting along for the past few years. He says he thinks they can have an "extraordinary relationship." He says their discussions will involve trade, the military, missiles, nuclear weapons and China, including their "mutual friend" China's Xi Jingping. He did not mention Russia's meddling in the U.S. election. The two leaders were seated together in a room adorned by American and Russian flags at the Finnish Presidential Palace, separated by a small table. The meeting started about 45 minutes late following Putin's delayed arrival to Finland. Russian President Vladimir Putin says it's time to talk seriously with President Donald Trump about relations between their powerful nations and global problems. Putin revealed little about his agenda in terse remarks at the start of talks with Trump in Helsinki. While Trump spoke more extensively amid incessant clicks of cameras, Putin said only that "the time has come to talk thoroughly about bilateral relations as well as various hotspots in the world." He called the meeting part of "continued constant contacts" between the men. Putin looked serious but smirked when journalists asked Trump about Russian meddling in the U.S. presidential campaign. Trump refused to answer. He and Trump shook hands briefly and headed into talks, which are being closely watched around the world. President Donald Trump has arrived at Finland's Presidential Palace for a summit with Russian President Vladimir Putin. Putin arrived minutes earlier at the palace in Helsinki for the summit, which consists of a one-on-one meeting and a larger working lunch, and will conclude with a joint news conference. Monday's meeting is being closely watched on both sides of the Atlantic, coming days after the U.S. Justice Department indicted 12 Russian military intelligence officers for their role in hacking Democratic entities during the 2016 presidential campaign. Trump says he hopes for better relations with the Russian leader. He faces bipartisan skepticism in Washington that his desire for warming ties is displacing concerns over Russia's annexation of Crimea and other destabilizing actions. President Vladimir Putin is using a newly designed Russian limousine abroad for the first time to get to the summit with President Donald Trump in Finland. Putin first used the Kortezh limousine during his inauguration in May but had never taken it abroad until now. Putin landed in Helsinki behind schedule for the summit. The use of the Kortezh could be a show of Russian pride to counter the U.S. president's world famous limousine known as "The Beast." Putin's motorcade included several other vehicles of the same Kortezh, or Aurus family. President Vladimir Putin has arrived late for his high-profile meeting with President Donald Trump — another display of the Russian's leader famous lack of punctuality. Putin's plane touched down in Helsinki 30 minutes later than planned, pushing back the start of his one-on-one talks with Trump Monday. In the past, Putin was late for meetings with Britain's Queen Elizabeth II and Pope Francis, among many others. In 2014, he was hours late for meeting German Chancellor Angela Merkel, after his previous stop in Serbia lasted longer than usual. Often seen as a trick to throw his interlocutors off balance, Putin's tardy ways appear to be more of a personal trait than a well-calculated strategy. Russian President Vladimir Putin's spokesman says he hopes the summit with President Donald Trump is a "baby step" toward fixing exceptionally bad U.S.-Russian relations. Ahead of Monday's meeting, Kremlin spokesman Dmitry Peskov told broadcaster RT that the men had no strict agenda but recognize their "special responsibility" for global stability. He said European countries shouldn't be worried about a possible U.S.-Russian rapprochement or decisions about Europe made "over the heads of Europeans." Peskov said the Russian leader respects Trump's "America first" stance because Putin puts Russia first, but said the only way to make progress at the summit is if both sides are open to finding areas of mutual benefit. Russian officials say Putin is expected to reiterate denials of meddling in the 2016 U.S. presidential campaign. U.S. first lady Melania Trump says she and her Finnish counterpart had a "good conversation about issues facing our nations." Mrs. Trump says in a tweet that she enjoyed Monday's talk, adding "Thank you to @JenniHaukio for hosting me!" Haukio is the wife of Sauli Niinistö (SAW-lee KNEE-nes-tuh), the president of Finland, which is welcoming Presidents Donald Trump and Vladimir Putin of Russia for a summit. The first ladies met separately over breakfast while their husbands held talks. Meanwhile, the Finnish tabloid Iltalehti took the American first lady to task with a front-page photo tweaking her for an alleged "breach of etiquette" because she walked off of Air Force One in front of President Trump after they landed at the airport in Helsinki on Sunday night. Finland's biggest newspaper has a message for Presidents Donald Trump and Vladimir Putin: Respect a free press. Daily Helsingin Sanomat has placed advertisements around Helsinki alluding to Finland's reputation as a hub for a free press. The advocacy group Reporters Without Borders has regularly ranked Finland among the top in its "Press Freedom Index" — including the No. 1 spot two years ago. The Russian in one of the black and white ads translates to: "Unpleasant things will happen to journalists who ask Putin questions." An English version for Trump said: "Mr. President, welcome to the land of free press." Trump regularly berates some news outlets as purveyors of "fake news." Putin is regarded as creating a culture of violence that has led to the killing of some Russian journalists. The European Union's foreign policy chief says the United States has remained a "friend" of the 28-nation bloc and said "a change in the administration does not change the friendship between countries and peoples." On Sunday, President Donald Trump named the European Union as a top adversary of the United States, saying "the European Union is a foe, what they do to us in trade." He added that "you wouldn't think of the European Union, but they're a foe." The EU's Federica Mogherini (feh-deh-REE'-kah moh-gehr-EE'-nee) says ahead of Monday's meeting of EU foreign ministers that "for sure, we consider the United States friends, partners - close friends and partners. We will always do that." Trump is meeting with Russia's Vladimir Putin in Helsinki on Monday. President Donald Trump says his upcoming meeting with Russia's Vladimir Putin will go "fine." Trump made the brief prediction Monday at a breakfast at Finland's presidential residence in Helsinki. He was meeting with Finland's President Sauli Niinistö (SAW-lee KNEE-nes-tuh) in the hours before his highly anticipated summit with Putin. Trump thanked his Finnish counterpart for hosting the summit in Helsinki and spoke of his commitment to NATO. Trump was a destabilizing presence at NATO earlier in his European trip, torching allies and demanding more defense spending before eventually reaffirming his commitment to the military alliance. NATO at its heart is a bulwark against Russian aggression. Finland is not a member nation but has a memorandum of understanding with NATO. Finland has also been the site of previous US-Russia summits. Trump has arrived at the the Mäntyniemi Residence in Helsinki, where he and first lady Melania Trump were greeted by President Sauli Niinistö (SAW-lee KNEE-nes-tuh) and his wife. Finland has a long legacy of hosting U.S.-Soviet and U.S.-Russian summits due to its geographic location and perceived neutrality. President Donald Trump is no fan of American journalists, but might love what the Russian media are saying about him ahead of his meeting with Russian Vladimir Putin. Russia's largely Kremlin-friendly TV networks, websites and newspapers portrayed Trump as a political maverick who is being unfairly targeted by his own compatriots. Newspaper Komsomolskaya Pravda dismissed the U.S. investigation into Trump's "mythical work for the Kremlin," and praised Trump for meeting Putin "despite opposition from his own elite and the hysterics of the media." Commentators on popular Sunday night talk show "Vecher" or "Evening" said Putin goes into Monday's summit in Helsinki as the stronger figure, notably coming off his hosting of the World Cup. They brushed off new indictments of Russians accused of hacking the 2016 U.S. presidential campaign. President Donald Trump says the U.S. relationship with Russia "has NEVER been worse" as he prepares for a high-stakes summit Monday with Russia's Vladimir Putin. Trump in a tweet is blaming the hostilities on "many years of U.S. foolishness and stupidity and now, the Rigged Witch Hunt!" That's Trump's favorite derogatory term for the special counsel investigation into Russian election meddling and possible ties to his campaign that has already led to a slew of indictments, including of a dozen Russian intelligence officers last week. Trump is also once again blaming his predecessor, Barack Obama, for failing to stop Russia's efforts in the 2016 election. He says Obama "thought that Crooked Hillary was going to win the election," so he did "NOTHING" about it when informed by the FBI. President Donald Trump is claiming credit for bolstering NATO as he heads into a day of meetings with Russia's Vladimir Putin. Trump rocked a NATO summit last week when he lambasted members for failing to meet defense spending pledges and questioned the value of the alliance before doing a 180 and embracing it. But Trump says in a tweet that he's received "many calls from leaders of NATO countries" thanking him for helping "to get them focused on financial obligations, both present & future." Trump says, "We had a truly great Summit" and claims it was "inaccurately covered by much of the media." Foreign policy observers will be watching to see whether Trump has kinder words for Putin in Helsinki than he did for NATO leaders in Brussels. European Council President Donald Tusk has urged President Donald Trump, Russian President Vladimir Putin and China to work with Europe to avoid trade wars and prevent conflict and chaos. Tusk was speaking Monday in Beijing at the opening of a summit between China and the European Union. He noted that Trump and Putin's summit in Helsinki would take place on the same day in Helsinki. Of the summit, Tusk said: "We are all aware of the fact that the architecture of the world is changing before our very eyes and it is our common responsibility to make it a change for the better." Tusk said Europe, China, the U.S. and Russia had a "common duty" not to destroy the global order but to improve it by reforming international trade rules. Their summit Monday in Helsinki will play out against a backdrop of fraying Western alliances, the investigation into Russian election meddling and fears that Moscow's aggression may go unpunished. The meeting was condemned in advance by an assortment of members of Congress from both parties after the U.S. indictment last week of 12 Russians accused of hacking Democrats in the 2016 election to help Trump.